Psy's solo concert 'HAPPENING' will be lively broadcasted. On the 5th, Mnet announced, "We will lively broadcast Psy's concert 'HAPPENING,' which is being held at Seoul World Cup Stadium in Sangam-dong on the 13th." Mnet will be broadcasting not only the concert but the atmosphere around the concert hall. They are planning a big-scale recording, mobilizing a helicopter which is unusual for a live broadcast of a solo singer. CJ is planning on turning the concert into a global culture festival with not only Psy's concert but also diverse brand festivals. Psy's concert 'HAPPENING,' which is a blockbuster scale concert with production cost of three thousand million won, is the biggest concert Psy has ever had since his debut 13 years ago. Professional staffs from US and JaPan will be using various special effects to make fancy videos and visuals. Also, the concert is receiving a lot of attention since Psy's new song 'Gentleman' will be released that day at the concert. During the press conference before Psy's concert, his international manager Scooter Braun praised Psy. 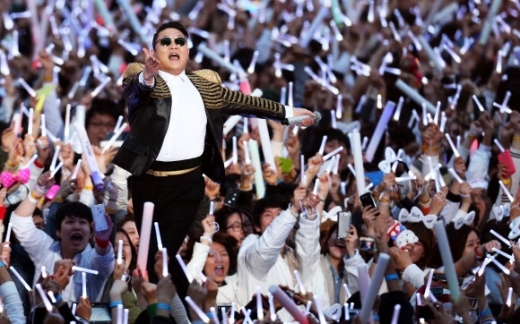 April 13, the international singer Psy held his exclusive concert "Happening" at the World Cup Stadium in Seoul. Psy revealed the music video for his new song "Gentleman" during the concert which was broadcast live via YouTube, Naver and mNet. Approximately 2 hours before the concert, Psy appeared at the press conference for his concert while being accompanied by Scooter Braun. Scooter Braun manages global stars like Justin Bieber as well as Carly Ray Jepson. During the press conference, Scooter Braun stated, "Psy delivered dreams through his music" and "He made people happy all around the world with 'Gangnam Style'." Scooter Braun continued, "Various K-Pop stars tried to enter the global music market but the only one who successfully dominated the market is Psy, which was definitely not expected. He broke down barriers between nations around the world and demolished some negative generalizations. Psy is an artist that gives hope to people in South Korea." Regarding the reported $3 million production Scooter Braun commented, "I've seen a lot of large-scale performances but I think Psy's concert today will be the biggest one" and expressed his happiness. between nations around the world." Scooter Braun also revealed, "After drinking soju with Psy, I've realized that I shouldn't go to the bathroom. While I was in the bathroom, Psy secretly added more soju to my glass and I ended up getting way too intoxicated" and laughed.